We’ve just completed development of an exciting new feature. 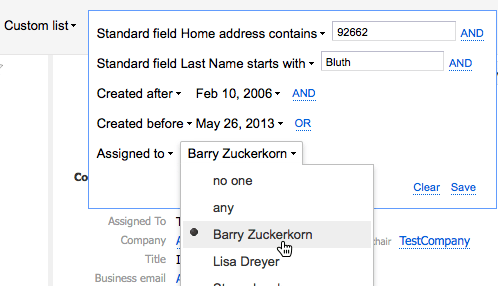 Custom search is a powerful and “Did someone say wonderful?” way to search for contacts, companies and projects. You may have some complex search requirements. Now, not only can you search for multiple tags at a time, you can also search for multiple date, number, text fields and other conditions. You can even search for “or” as well as “and” conditions at the same time so you can pinpoint what you are looking for. With these so many juicy options your search experience will be off the hook. “Don’t forget me now!” Save your time! Save your searches! Custom search criteria can be saved as a named list. Access an up-to-date version of a custom search in just one click. People do business with people. While your team may track companies, it’s the contact relationships you need to nurture. Search for companies, then find all the contacts related to them with one-click. Ideal for mailing lists. No exporting, no cross-referencing, no problem.